Home » The Project » Where are we at? Q: Are all of the released birds breeding now? A: All the released birds are now (2019) at breeding age although some of the younger birds did not breed in 2018. There is also a slight imbalance of males and females so there may always be some unpaired birds. 2018 saw 21 pairs of birds from the release project form and go on to make breeding attempts. The population now also contains second generation birds that will be at breeding age in the Spring of 2019. 2013 and 2014 saw the first tentative breeding attempts by pairs on the Somerset Levels and also at the WWT Slimbridge Reserve in Gloucestershire. These early attempts did not result in any chicks fledging. 2015 was the first year the project produced fledged young - the first int he South West of England for over 400 yrs! 16 pairs formed and held territories, many in the Somerset Levels and Moors, but others in South Wales, Wiltshire, Gloucestershire, Oxfordshire and East Somerset. Nine of these pairs made breeding attempts with four of these going on to hatch and raise chicks. Three of these four pairs went on to raise a chick or chicks to fledging: Alexander, a 2012 male, & Swampy, a 2011 female on private land in Somerset (raising twins); Minnie, a 2010 male & Wendy, a 2010 female, on the WWT Reserve at Slimbridge (raising a single); and Midnight, a 2012 male & Gemma, a 2010 female on private land in Wiltshire. These six birds were the first to successfully raise young to fledging. 2017 saw 10 of 19 territorial pairs make breeding attempts, successfully raising a further 4 chicks to fledge. The drop in number of both territorial and nesting pairs in 2017 is thought to be due to the exceptionally dry spring that meant food was hard to come by, and suitable wet nesting sites were scarce. Successful pairs were Legend, a 2011 male & Elle, a 2011 female (raising a single); Timmy, a 2011 male & Michaela, a 2010 female (raising twins - one of which was caught and ringed Red Black Green -nicknamed Eugene) and Manfred, a 2013 male, and Diamond, a 2014 female (raising a single - which was caught and ringed Red Yellow Green and nicknamed ManDi). All these 4 chicks fledged from the RSPB West Sedgemoor Nature Reserve in Somerset. 2018 saw further increases in hatching and fledging with 7 chicks fledged in total from 22 nesting pairs. Birds bred in Somerset, Gloucestershire, Oxfordshire, Cambridgeshire and South Wales at 2 separate locations. Successful pairs were: Legend (2011) & Elle (2011) raising 1 chick; Gerald (2011) & Flash (2011) raising 1 chick; Jasper (2012) & Viridor (2013) raising 1 chick which was ringed White Red Green; Wiz (2012) and Pippa (2011); Bart (2010) & Ruby (2010) raising 2 chicks; and Oakie (2013) and Sherbert (2014) raising 1 chick. The breeding fortunes for the last few years are tabulated below. You can read more in the annual reports, and on the individual crane pages. The project targets is to establish 20 regularly breeding pairs in the South West by 2025 with a five year averaged annual productivity of 0.40 fledged chicks per territorial pair. Q: How many eggs were collected for the reintroduction? A. The project aimed to collect 24 eggs each year for five years. 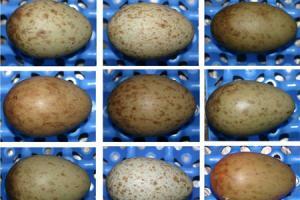 Over the five years 2010-2104 we have transported 121 eggs back to the UK, 114 of which hatched. From these 115 chicks - 93 have been reared to release, with 3 being held back in captivity for welfare reasons. Q: Has this had any effect on the German population? A: It would appear not. 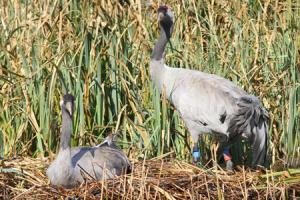 Our Germany partners have been very diligently monitoring the pairs of cranes from which we take the eggs, and there appears to be no statistically significant difference in fledging success of pairs from which we take eggs, and pairs from which we don’t. In other words the birds re-lay once we have removed the eggs, and these new eggs go on to hatch and fledge with the same % of success as other pairs in the same study area where we don’t take the eggs. Q: How many birds did you release on the Levels and Moors? 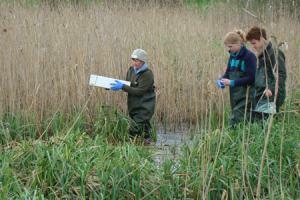 A: We have released 93 birds in total. 21 in 2010, 17 in 2011, 19 in 2012, 19 in 2013, and 17 in 2014 - one of which was taken back into captivity to leave 92. Q: How many of the released birds survive? A: 58 of the released birds are currently known to be alive (fig at end Dec 2018). This represents a 62% survival rate to date. T he project had a target of 60% survival to adulthood and this was exceeded with each cohort. This 60% survival rate is usual for birds across their range in continental Europe. The released birds have done much better than we thought they might, particularly seeing as they have to make it through tricky periods such as their first moult, where they become flightless for a period of around five weeks – see below. Q: What happened to those that didn’t survive and have you any missing birds? A: Two birds of the first cohort died during their first Autumn. A bird known as Jack flew into powerlines and was killed, and a bird known as Howard disappeared in the autumn, and its remains were found much later, with the cause of death not clear. A third bird, Dennis, from the 2010 cohort was taken back into captivity for his own welfare and is currently within the Pensthorpe Conservation Trust collection. The following autumn, on the release of the 2011 cohort a bird known as Mildred flew off, was seen in Kent and then disappeared. She has not been seen since and we don’t know if she is alive or dead. Another bird from the 2011 cohort, Gizmo, became ill over his first winter, was alone and isolated from the group, and was taken by a fox in the night. In 2012 a bird known as D2 sustained a fairly severe leg injury, but proved uncatchable for treatment. It became a bit of a loner, and was probably pretty under the weather, when it was finally taken by a fox in March 2013. Trinny from the 2011 cohort went missing in April 2013 - but in the company of an unringed cranes - so perhaps she went abroad. No sightings have been reported mind you. Vince from the 2010 cohort went missing in May 2013 around the time of the start of moult. Her whereabouts or life status are unknown. Clarence also from the 2010 cohort started behaving oddly in spring 2013, hanging around on his own a lot - which usually indicates that a bird is ill. We saw him go into moult in June, however, and are pretty confident he was seen in flight following moult in July - but he has subsequently disappeared - and has not been seen again. The radio tag and a few scraps of feathers and bones of Jess from the 2012 cohort were found in early September 2013 - her cause of death is unknown. Jess had always been quite a weak bird, and a poor flier - but had seemd to be been doing OK post release. The remains of White Green Yellow, one of the 2013 cohort were found out on the moors in early November following release. His cause of death is unknown, but his remains had been scavanged by a predator, most likely a fox. Charlie - one of the 2011 cohort, went missing in late October 2013, and has not been seen to date and Frieden - one of the 2013 release cohort disappeared during the winter of 2013/14 and has also not been seen again. A report of Frieden's ring combination has been received from Germany, however, but was not confirmed. Pepper - one of the 2011 Cohort was last seen in December 2013 - cause of disappearance unknown. Sven - a 2013 male had a collision with (we think) a powerline in February 2014, and was found, recovered and taken for treatment, but had to be put-down on account of a severely broken wing. Misty Moor, also from the 2013 cohort was last seen in May 2014 and his whereabouts are unknown. Two of the 2014 cohort Humbug and Yellow Red Black were found dead in early November 2014. Cause of death of these two were likely to be linked to leg injuries that they sustained shortly before being found dead, although the cause of the initial injury, and cause of death is unknown. Mennis - a 2010 male went missing in Nov 2014 - reason unknown; Gilbert - another 2010 male picked up a severe leg injury, was seen to deteriorate in condition and then went missing in January 2015. Minnie another one of the first (2010) cohort one of the first males to successfully fledge a chick, went missing in the autumn of 2015, and the 2010 bird Chris the first female to hatch eggs in 2014, was found emaciated and ill at WWT Slimbridge in February 2016 and sadly, had to be put down. Stanley a fine and feisty 2013 male unfortuately collided with a fence and was killed in the Spring of 2016, and later that summer, 2 more 2013 birds - a female called Buttercup and a male called Willow were both lost at or around moult. In September 2016 the body of the project's most productive female - Swampy was found, and post mortem discovered that she had been shot - the only bird known to have been lost through this cause. Despite a reward being offered and a significant police investigation, no-one was caught or charged with this wildlife crime. 2017 saw Midnight, Billy, Dillon and Stowford go missing - and without these birds being seen again they are presumed dead. 2018 saw Lofty not return to Somerset after making a breeding attempt in Wales; Skye and Cosmo went missing and are now presumed dead; Cotton and Bart both died due to disease; and Wally became entangled in his backpack harness and sadly died. Q: So with many of the birds now over 3 years old... they must have had their first moult? A: Yes – most of birds appear to be going into their first full wing-feather moult in their third or fourth year. They tend to find a very quiet area out on the moors where they are undisturbed and can roost in safety. Each year the moult period is a tense time for us all as - and it seems that some birds are lost most years around this time - it is clearly a very stressful and danger-fraught period in their lives. Q: Are all the birds in Somerset still? A: No and Yes! 2 years after the initial release in 2010, a handful of birds moved further north and have made a permanent home in the Wetlands of the Severn Vale - often to be seen feeding on the WWT Slimbridge reserve. Although there appear to be a usual gang of around 11 birds at WWT Slimbridge there have been other movements of birds between the two areas and the picture is complicated and often confusing! The birds certainly don’t seem to find it any effort to move between the sites – with the biggest movements usually coinciding with periods of high pressure and good thermals. Ringed, released birds from the project which have ended up back in Somerset - have also been seen on occasions as far north as Staffordshire, as far west as Glamorgan, Wales, as far South as Devon and incredibly as far east as Suffolk! More information on the movements can be found in the annual reports. 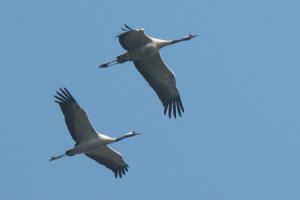 Q: Have they mixed with other resident cranes from the east and north of the country? A: An unringed crane turned up for the first time in the autumn of 2011 and stayed with the flock in Somerset over the winter. This bird then left the flock in the Spring of 2011 – at the same time as one of the ringed birds turned up in Suffolk. The origin of this bird is unknown – but it could well have been from the UK population rather than from the continent – and may have led the ringed bird to Suffolk. 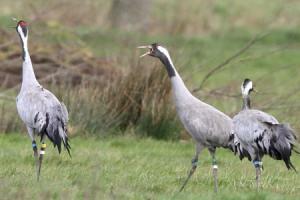 An unringed crane appeared with the birds at WWT Slimbridge in autumn 2013, and then moved to Somerset for the winter of 2013/14. The origins of this birds are also unknown. The project hoped for an eventual mixing of the two populations and in 2016 one of the 2011 project females Beatrice, was reported with an unringed fenland mate on the Cambridgeshire/Norfolk border. Beatrice and mate made a nesting attempts in 2016, 2017 and 2018 in Cambridgeshire where she remains. Unringed cranes turn up with the Somerset flock regularly now - but with a number of the 2nd generation birds unringed - it is now almost impossible to know of their origin. 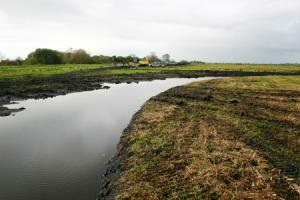 Q: What about the habitat aims of the project – how is all that going? A: Very well! Along with the release of the birds the project has been working to create new suitable crane breeding habitat across the Levels and Moors so that the project can achieve its target of 20 breeding pairs by 2025. Enhancement works have been carried out the RSPB’s own landholding at West Sedgemoor and Greylake, and on private land on Aller Moor to the West of Langport, Walton Moor near Street, Northmoor near Aller, Cossington Moor, Kings Sedgemoor near Henley, and Moorlinch Moor to the North of the RSPB's Greylake Reserve. 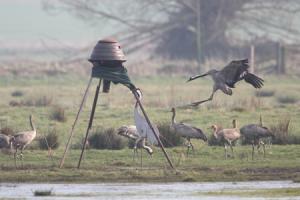 Sites on the Somerset Levels and Moors that are managed by the Somerset Wildlife Trust and Natural England at Catcott Lows and Shapwick Heath are now also being managed with cranes in mind too, and some of the created sites are now being used as breeding and roosting areas.